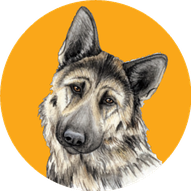 Paddy the German Shepherd dog was rescued from a dingy concrete kennel at a dog re-homing centre in 1990. What came next was the challenge to nurse frail Paddy back to health, and following a few months of rehabilitation, Paddy showed signs of improvement. 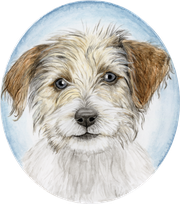 Paddy is featured in Book 1, Rescue Paddy in the Jack, Lilly and Friends series. Jack is a 5 year old long haired Jack Russell. As a puppy he lived in Bristol but had to find a new home as he lived in a very small flat without a garden. He was collected by a new family and taken to their spacious home in Kent. He is a bit grumpy at times and very protective over his much loved family. Jack loves going out for long walks through the woods and going to the seaside. 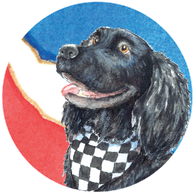 Jack is featured in Book 2, Lilly and Six in the Jack, Lilly and Friends series. Lilly is a 3 year old Bichon and West Terrier cross who was born on a farm in Kent. She was introduced to her new home that she now shares with Jack. When she’s not fast asleep or resting, she loves to go out for long country walks especially in the woods. Lilly also loves to swim, she loves to run very fast and jump into a cool lake especially on a hot summers day. Lilly has also been a mum to 6 puppies and still sees them regularly as they all live close by. Lilly is featured in Book 2, Lilly and Six in the Jack, Lilly and Friends series. 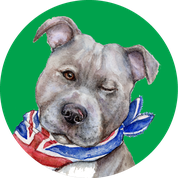 Nelson is a Staffordshire Bull Terrier. He comes from Barking in East London, but now he lives in Kent. He has had a rough start in life and lived on the streets for many years, however he is now happy after finding his new home. 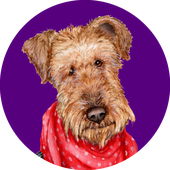 Nelson is featured in Book 3, Barking Mad in the Jack, Lilly and Friends series. 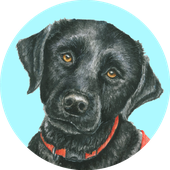 Hello everyone, my name is Pal, I live in Kent and I am a trained assistance dog. 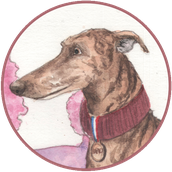 I assists my owner 24-hours a day by alerting them to sudden changes in their sugar levels and supports their day to day life with my ability to protect them with my fantastic scent detecting skills. I am extremely helpful and I can also fetch medication when required. I am also trained to alert relatives or neighbours if my owner is unwell. 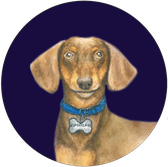 Pal is featured in Book 3, Barking Mad in the Jack, Lilly and Friends series. Hi there, my name is Meghan. I'm a fully trained protection dog, proud to be part of the English Police Force. 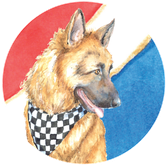 I have been specially bred by a history of detection dogs to keep our breed and our expertise levels to the highest degree. I love my role in the police force, it's so exciting! Every job that we attend is different, I cannot wait to be working alongside handsome Harry. Meghan is featured in Book 4, Harry and Meghan in the Jack, Lilly and Friends series. My name is Harry, i'm a serving police dog and extremely proud to be fighting crime on the streets of Great Britain. My job is full of excitement, catching burglars, high speed car chases and finding missing people is such a rewarding part of my job. I love being in the police force. In my story, I have a new partner joining me. Read all about how we become great partners! Harry is featured in Book 4, Harry and Meghan in the Jack, Lilly and Friends series. Hello darlings! I am sure you have heard about me already, my name is Primrose the Pink Poodle. I am also sometimes called Precious, especially in my home village by my friends and by some of my many admirers. I often attend doggy fashion shows and strut my stuff on stage. I am the unforgettable Primrose, the Pink Poodle. 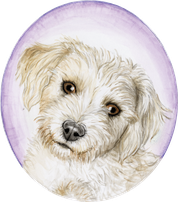 Primrose is featured in Book 4, Harry and Meghan in the Jack, Lilly and Friends series. Buffy is a Lakeland Terrier, she lives life to its fullest. She has always lived by the coast and adores the wonderful fresh air and smells that come from the sea. She also loves chasing sea gulls and watching other dogs play around on the sands. 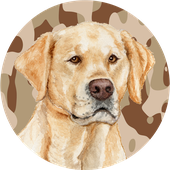 Ex-military explosives search dog back from various overseas deployment, Major K-9 the Golden Labrador is always at the ready and is never off duty, likes to remind all his friends that he is available to assist and check everything to make sure it is safe in every circumstance. Major K9 is a highly tactically trained dog and is very proud of his explosive detection's saving lives in the British Army. Hello everyone, my name is Cumberland the sausage dog. I live at the butchers shop in a very interesting village. I love living in a butchers shop I am so lucky, I do have to wait patiently all day though for scraps of meat or perhaps the odd tasty bone that gets given to me if I am a good boy, at the end of the day when its time for my dinner I get my special meaty treats of the day, each day seems so long!!! The retired racing Greyhound Turbo, lives with his best friend Rapid. 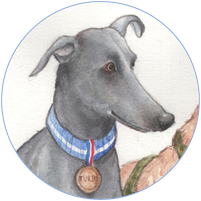 Turbo won many races and is very proud of his colourful rosette collection from his racing days. Rapid is another retired racing Greyhound who just adores his best friend Turbo. Rapid looks out for his friend and the pair are inseparable, they are a true team mate partnership. They often reflect on their racing days and their speedy wins.